If the government shutdown was supposed to stifle the economy, somebody forgot to tell employers that. They hired, on a net basis, 304,000 employees last month… the strongest growth since February of 2018. Higher wages suggest employers had to fight to attract those workers too. And yet, although the 800,000 furloughed government workers were technically counted as employed for the purpose of the Department of Labor’s number-crunching, it can’t be ignored that the number of people with jobs fell, while the number of people officially unemployed expanded. Those would almost be red flags were it not for the fact the labor force participation rate surged to a multi-year high, as did the portion of the population with jobs. The data, for February anyway, merits a line-by-line examination. The U.S. added 304,000 payrolls last month, exceeding expectations, and making it an above-average month. The economy has seen net job growth for 100 consecutive months now. Yet, the unemployment rate ticked higher, from 3.9% to 4.0%. Although the government shutdown theoretically wasn’t supposed to impact employment calculations, undoubtedly the ripple effect from the closure adversely impacted some employees that indirectly serve the government, or directly serve those who have been furloughed. Yes, it’s a mixed message that doesn't become any less mixed when looking at the raw numbers. 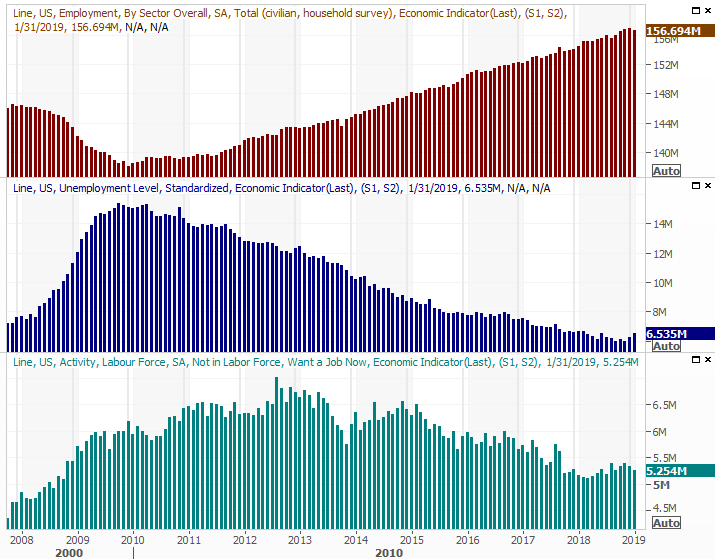 Last month, the total number of workers with jobs fell from a record of 156.9 million to 156.7 million, while the number of workers officially unemployed (receiving benefits) grew from 6.3 million to 6.5 million. The two numbers jibe with one another, and the latter jibes with the unemployment rate calculation; the official unemployment rate is calculated by dividing the number of unemployed individuals by the size of the workforce. The curious detail in this headcount? The number of people without jobs but not receiving benefits either actually fell, from 5.33 million to 5.25 million. 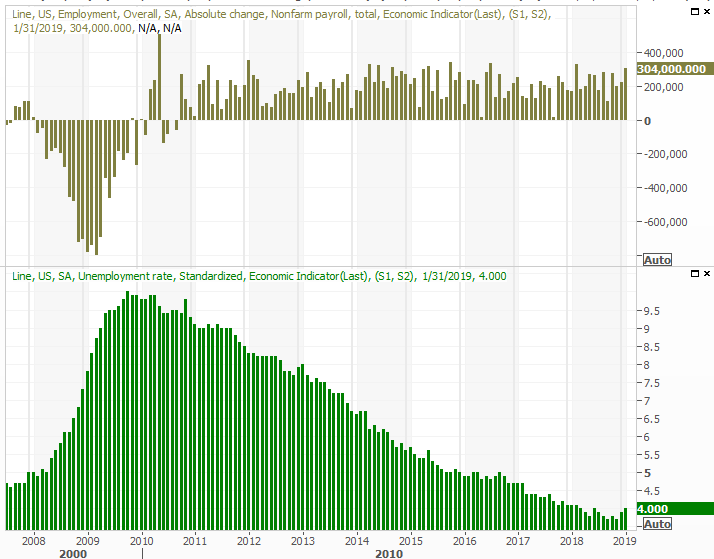 Though it tends to rise and fall with the official unemployment figure, this disparity implies that people who’ve been sidelined are finally coming off the sidelines as new job opportunities open up… an idea underscored by last month’s net payroll growth. That idea is underscored by January’s labor force participation rate and the employed/population ratio. The labor force participation rate (meaning those individuals either have a job or want one) moved to a multi-year high of 63.2%. Meanwhile, the portion of the population that’s officially in the labor pool, working or not, moved to a multi-year high of 60.7%. These aren't numbers that would have been impacted by the government shutdown in either direction. More of the country is working than has in years, and more of the country feels they’ve got a shot at landing a good job than has in years. That reality, coupled with net payroll growth in spite of the shutdown, speaks volumes. Wage increases suggest the same. Hourly earnings grew 3.2% year-over-year, moving deeper into record-high territory after starting to ramp up in a meaningful way in early 2018. It’s a confusing report to be sure, tainted by the uncertainty of the impact of a government shutdown that is temporarily over, and will soon be permanently over. But, the shutdown should have only hurt the January jobs report. Not that it wasn't without any dents or dings, but by and large it was an encouraging report that says the economy has mostly shrugged off the shutdown. Overall grade? We give it a B+, with extra credit awarded for overcoming some tough circumstances.